The Old Store is a character brick and flint house on the edge of the Goodwood Estate, near Chichester. Comfortable rooms with en-suite shower rooms, car park and garden and good pub nearby. Breakfast is our speciality with home baked bread, home made jams and marmalade and a varied menu. Recommended in The Good Hotel Guide. 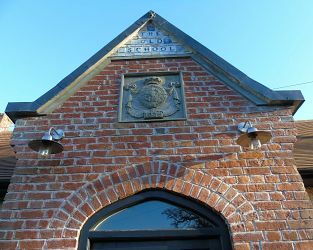 Come and stay in a charming former village school dating from 1839. The Old School has three unique and elegant bedrooms - one king-size and two luxurious doubles. Our bedrooms are all en suite and located on the ground floor. We offer a warm welcome and a relaxing stay in an environment of gentle high quality. Visit Chichester West Sussex and the surrounding villages and stay in bed and breakfast, hotel or self catering cottage accommodation provided by BedPosts members. The Romans founded Chichester (calling it Regnum) at the intersection of two important roads, a point now marked by the beautiful 16th century Butter Cross. The site of the Roman amphitheatre is at the east end of the town. The Normans built Chichester Cathedral on the site of a Saxon church; two sculptures in the north choir aisle are almost certainly Saxon work. Note the striking picture by Graham Sutherland, the cope designed by John Piper and modern glass by Christopher Webb in the north aisle. In St Martin's Square is the almshouse known as St Mary's Hospital, a lovely 13th century building which stands almost as built. The 15th century church of St Andrew's contains the grave of the poet William Collins, who died here in madness in 1759; and in the medieval Guildhall, William Blake, the great artist and poet, was tried for high treason in 1804 and acquitted. A modern structure of more than usual interest is the theatre built in 1962 for the Festival. Chichester ‘harbour’ is an extensive inlet from the sea reaching from Chichester across to Hayling Island; a wonderful stretch of water for small-boat sailing, full of delightful creeks and protected from the sea swell by a narrow entrance with a shallow sand ‘bar’. 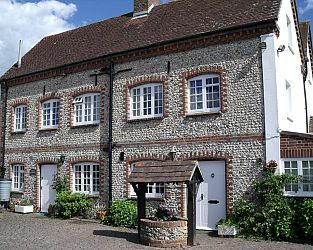 If you seek accommodation near Chichester in West Sussex you have come to the website of a “club” of providers who offer affordable quality accommodation around UK in hotels, bed and breakfasts, guesthouses, inns, and restaurants plus self-catering cottages and apartments .